Signature Smile Studio is a Frankston dental clinic that offers a wide range of dental services, including general maintenance, restorative dentistry, cosmetic treatments and emergency care. Dedicated to being there every step of the way on your dental journey, our passion lies in helping you reach the best oral health and achieving a smile that will boost your confidence. We also offer composite fillings to rectify any decay or damage that may be present in your teeth. At Signature Smile Studio, our composite fillings are a useful, durable and effective way to restore teeth. 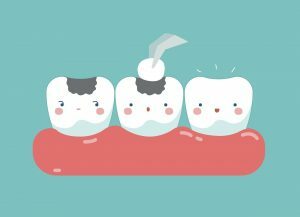 If a cavity is present from decay or damage, composite resin fillings can be used to match the colour of your teeth so they look natural. We make it our priority to achieve incredible looking smiles that are also completely healthy. If you think that composite teeth fillings might be something you require, our dentist will be able to examine your teeth during an appointment and recommend the best restorative dental care for your needs. Contact our Frankston dental clinic today to discuss how our dentists can assist with composite fillings and other restorative dentistry procedures. You can also arrange an appointment with us for a check-up that can determine if you need fillings. Simply call us on (03) 9783 2747 to make an appointment with a dentist Frankston locals trust.